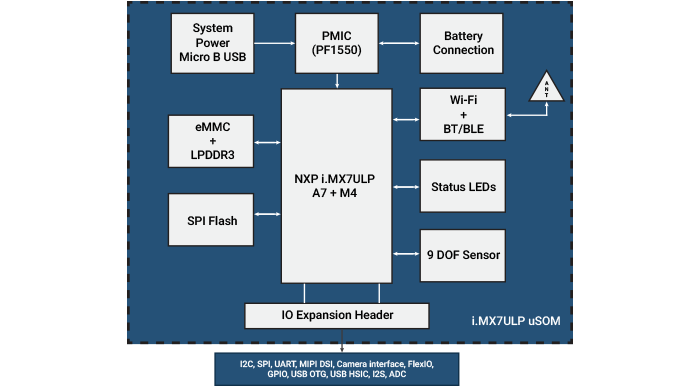 The VOL NXP i.MX7ULP uSOM is an ultra-low-power processor SOM featuring heterogeneous multi-core processing architecture with an Arm® Cortex®-A7 core which operates at 800MHz, paired with an Arm® Cortex®-M4 core which operates at 200MHz. It also has 3D and 2D Graphics Processing Units (GPUs), 32-bit LPDDR2/LPDDR3 external memory, flash memory, and supports interfaces like MIPI DSI display, parallel camera, I2C, SAI, UART, SPI, USB, etc. The Cortex® A7 core supports Android & Linux operating systems whereas the Cortex® M4 core supports FreeRTOS. It is a highly integrated multi-market applications processor designed to enable ultra-low-power and secure, wearable applications. Targeted towards the growing market for portable devices, it is best suited for use cases demanding long battery life and high-end graphics. Integrates the GC7000 Nano Ultra GPU supporting OpenGL ES2.0/1.1, desktop OpenGL 2.1, OpenVG 1.1, and GLSL shading language support. SPI 2x interface, synchronous serial interface with clock configurable to 60 MHz master/ 30 MHz slave modes max. 2x interface, synchronous serial interface with clock configurable to 30 MHz master/ 15 MHz slave modes max. 2x interface, synchronous serial interface with clock configurable to 60 MHz master/ 30 MHz slave modes max. 2x interface, synchronous serial interface with clock configurable to 30 MHz master/ 15 MHz slave modes max.